The Villages, Florida United States - GOLF CART DESIGNER HOME GAS GRIL | RE/MAX PREMIER REALTY Inc. Looking to get away to The Villages. Come and enjoy our lifestyle by staying in this beautiful home in Chatham. Lovely Boganvilla floor plan, corner lot on cul-de-sac street. Near Nancy Lopez Country Club and Golf Course, close to the VA Medical Center and grocery shopping. Easy access to Hwy 42. 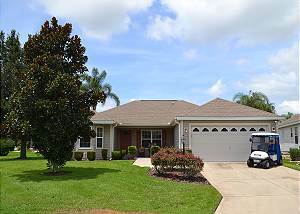 Golf cart is included in this three bedroom and two bath home with a den. This home has a flat screen in the master and a flat screen in the living/den area. 3rd bedroom has a queen day bed. This home has separate dining area along with a bar in the kitchen for quick meals/snacking. Inside washer and dryer. This home is very close to the Chatham recreation center pool and clubhouse. Large 2 car garage, completely furnished. No smoking. . Call and book today. Birch brook Ave, The Villages. A guest from Sharon, MA United States recommends this vacation rental. Accurate description of this very clean, well stocked home. Dena from Remax always was available and didn’t hesitate to contact owners for maintenance issues. Being a pet friendly home was a real attraction to rent this home. The only suggestion is the TV is quite old and basic cable is the service. With all the options available a smart tv with HD is the current standard guests expect. Thank you for your feed back and will pass your suggestions along to the owners. Hope to see you next year!